Bikepacking is an up-and-coming trend in cycling. Freedom. Nature. Time well spent. What could be better than setting off into the wilds for a few days’ mountain biking and camping? That’s what Alan Brown did, and he chronicles it all Overlander, published by Saraband on 21 March 2019. Seeking a temporary escape from city life and a world gone mad, Alan plots out a personal challenge: an epic coast-to-coast trip across Scotland – from Argyllshire’s Loch Etive across remote Rannoch moors, dramatic Grampian terrain and the beautiful glens of Strathspey to reach the Moray Firth at Findhorn. He traverses paths historic and new, armed only with the essentials and a sense of adventure and curiosity. For bikepacking is the polar opposite of super-expensive whizzy bikes, eye-wateringly tight lycra, and marauding packs of MAMILs. It’s about going back to basics: forgoing speed and modern fripperies. It’s about taking a risk, having an unforgettable experience – savouring the landscape and discovering more about nature, history, people, your country, the concept of risk, and yourself, than you ever thought possible. Alan also gets to grips with the vexed subject of land ownership and use in Scotland – how all those miles and miles of bleak grouse moor and deer forest are not only bad for ecology, but also putting people off exploring their own countryside. 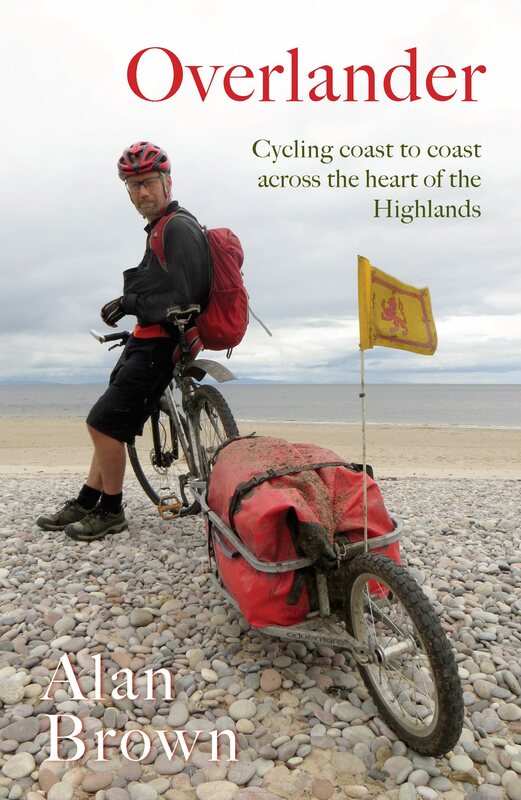 He issues a clarion call for change in the Highlands, and for more people to get on their bikes … and slow down. Alan Brown will be launching Overlander at Lighthouse Books, Edinburgh, on 28 March, 2019, 6.30pm.